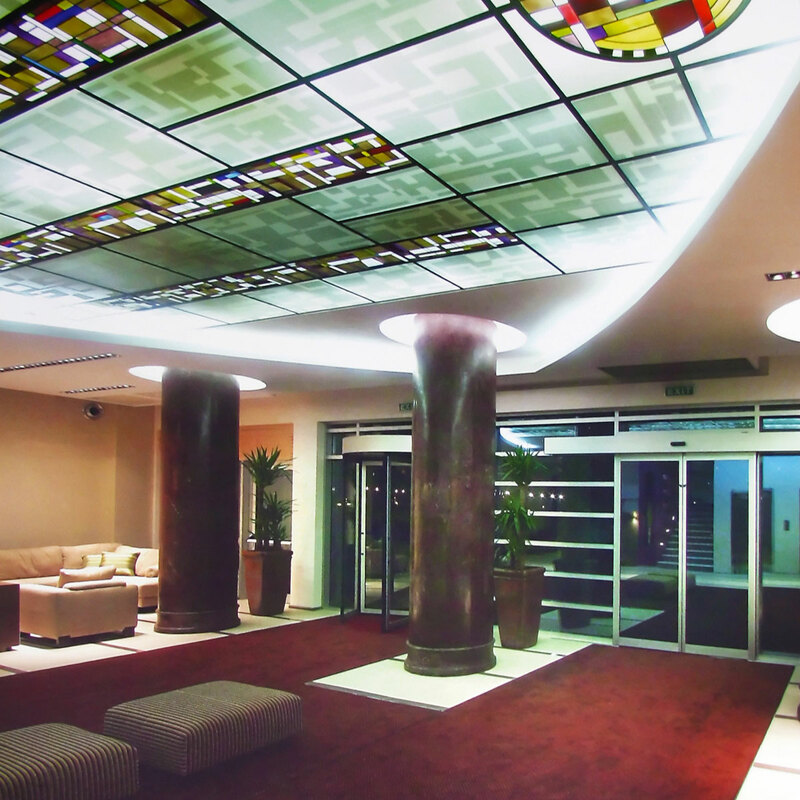 The term stained glass can refer to coloured glass as a material or to works produced from it. Throughout its thousand-year history, the term has been applied almost exclusively to the windows of churches and other significant buildings. 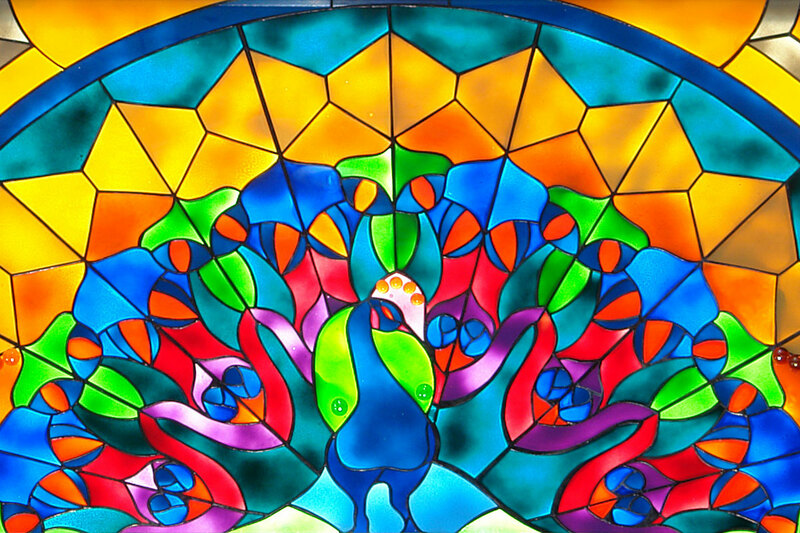 Although traditionally made in flat panels and used as windows, the creations of modern stained glass artists also include three-dimensional structures and sculpture. Modern vernacular usage has often extended the term “stained glass” to include domestic leadlight and objets d’art created from lead came and copper foil glasswork exemplified in the famous lamps of Louis Comfort Tiffany. 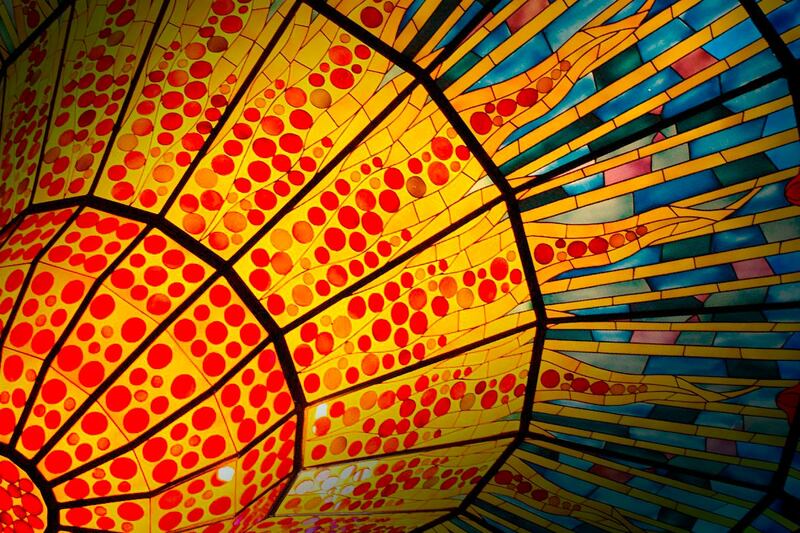 Stained glass, as an art and a craft, requires the artistic skill to conceive an appropriate and workable design, and the engineering skills to assemble the piece. A window must fit snugly into the space for which it is made, must resist wind and rain, and also, especially in the larger windows, must support its own weight. Many large windows have withstood the test of time and remained substantially intact since the late Middle Ages. In Western Europe they constitute the major form of pictorial art to have survived. In this context, the purpose of a stained glass window is not to allow those within a building to see the world outside or even primarily to admit light but rather to control it. For this reason stained glass windows have been described as ‘illuminated wall decorations’. The design of a window may be non-figurative or figurative; may incorporate narratives drawn from the Bible, history, or literature; may represent saints or patrons, or use symbolic motifs, in particular armorial. Windows within a building may be thematic, for example: within a church – episodes from the life of Christ; within a parliament building – shields of the constituencies; within a college hall – figures representing the arts and sciences; or within a home – flora, fauna, or landscape. During his life, Louis Comfort Tiffany (1848 – 1933) managed to be a painter, interior designer, collector, world traveller, photographer, manufacturer and avid gardener. Today he is commonly recognized as one of America’s most influential artists, designers and craftsmen of his century. 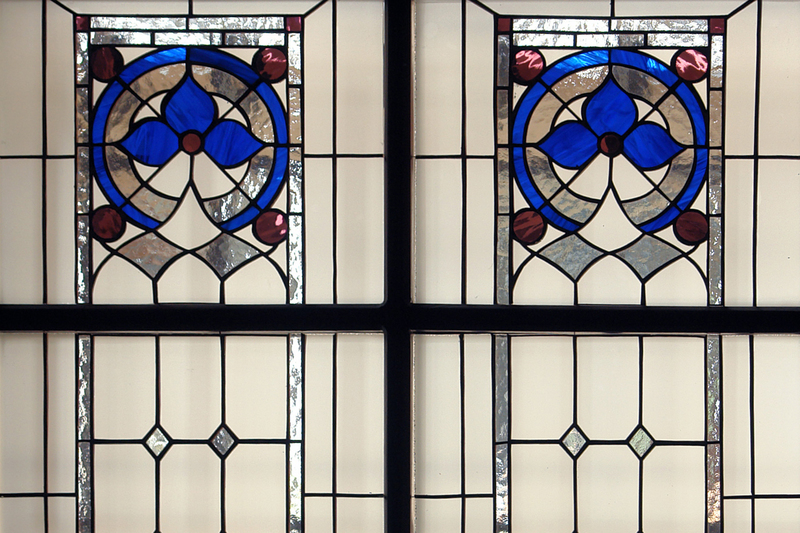 Tiffany clearly influenced local Napier architect, Louis Hay, resulting in the famous grape and fruit motifs used in many of the leadlights in The Master’s Lodge. Louis Comfort Tiffany was the son of Charles Lewis Tiffany, founder of Tiffany & Co., America’s foremost retailer of luxury goods. Although his father had initially hoped that his son would succeed him as head of the company, Louis Comfort Tiffany’s early interest was in painting. In the 1860s and 1870s, Louis studied under the American landscape painter George Inness, Tiffany combined the use of light, colour and nature in his work. He received praise for his oils and watercolours, which included scenes from his travels in Europe and North Africa. By 1879, Tiffany had established himself as a serious artist. In the same year, he also seized up the suggestion of Candace Wheeler that he join with Samuel Colman and Lockwood de Forest to form a firm that would apply aesthetic idealism to the practice of interior design. Impelled by Tiffany’s leadership and nascent talent, as well as by his father’s money and connections, Louis Comfort Tiffany and Associated American Artists thrived in the fields of interior design and decorative arts. His commissions for Mark Twain, Cornelius Vanderbilt and the White House under President Arthur earned him an international reputation and great success. 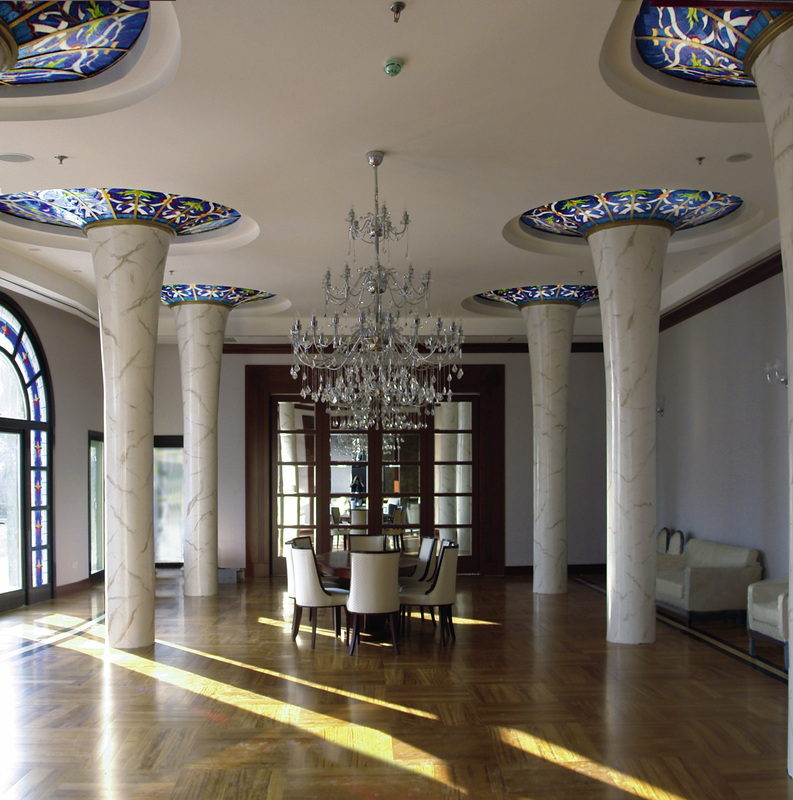 Stained-glass windows were a feature in these interiors. Tiffany actually had begun his glass experiments about 1875 to 1878, when he was working at glasshouses in Brooklyn, where his later rival, John La Farge was also working, both being particularly interested in coloured and opalescent glass. In 1880-81, Tiffany began designing glasswork of remarkable beauty. His unique style became a driving force behind the emergent Art Nouveau style, challenging the current Victorian ornate style. Art Nouveau used free-flowing designs based on nature that exemplified the characteristics prevalent in Tiffany’s earlier creations as a landscape painter. The use of light, colour and nature assumed greater significance in Tiffany’s work as he developed his unique approach. Tiffany wanted to elevate decorative arts to the level of fine arts, available to a wide audience. He incorporated Tiffany Glass Company on December 1, 1885, which later became known as Tiffany Studios. In 1895, his glassware was exhibited in Samuel Bing’s Gallery “L’Art Nouveau” in Paris. In 1902, he became art director of his father’s legendary company, Tiffany & Co. in New York. He designed for the firm coloured glass table lamps and lampshades, which were made in more than one edition. It was Thomas Edison who urged him to focus on electric light production after their collaboration on the design of the first Moving Picture Theater. Tiffany also designed and produced glass vases, tiles, mosaics and stained-glass-windows. The pieces he produced between the 1890s and 1918 were magnificent, exotic and of the highest quality. He mass-produced work of superior design with outstanding handcrafted details and he patented various types of glass, amongst them the iridescent glass called “Favrile”. Tiffany functioned as the ultimate authority over more than three hundred workers, designers and artists, glass blowers and gaffers, and artisans of numerous other tasks. By Tiffany’s death in 1933, the popularity of his decorative works declined with the rise of Art Moderne and Expressionism. For two decades the designs of Louis Comfort Tiffany were forgotten. It was not until the first Tiffany retrospective show in 1958 that museums and collectors rediscovered his objects. Awareness of Tiffany’s craftsmanship escalated with an Art Nouveau show in 1960 at the Museum of Modern Art. Today the designs of Louis Comfort Tiffany are honoured and treasured around the world, confirming Tiffany’s legacy as a visionary of Art Nouveau design.